Happy Holidays from Go Inspire Go! 'Tis the season to celebrate, give and inspire those around you as we come to an end of another great year. 2012 has been an eventful year for GIG as we continue to grow, creating three times the amount of original content as last year. We wouldn't have been able to do it without our 30+ volunteers around the globe, the everyday do-gooders we feature, and folks like YOU! To thank you, we wanted to kick off the holidays with 12 Days of Inspiration! Starting Dec. 13, we started counting down to Christmas by sharing one our original GIG stories each day, followed by an inspiring action item we want you to do right away. We're asking you to share what you were inspired to do via social media. KIND Snacks has partnered with Go Inspire Go to launch our 12 Days of Inspiration. We kicked off our 12 days of inspiration with a GIG Spark video from across the street from the Ferry Building in San Francisco, giving postcards to strangers and asking them to write a message to soliders who can't spend the holidays with their family. GaiamTV and Volunteer Match are also joining virtual forces with us to share via their social media platforms each of the 12 days. Thanks for the love -- won't you join us? Check GoInspireGo.com. We've counting down to Christmas by sharing our inspiring videos for 12 consecutive days on GIG's website and blog. Our goal is to see how many countries we can get to share our campaign. 1. We need you and your friends/community to download this special 12 days GIG logo and post it as your/their profile pic for 12 days. 2. Share our FB posts/tweets everyday for 12 days. We want to see how many countries we can reach with our message. GIG teams up with Kind Healthy Snacks to wish our soldiers a happy holiday and express appreciation for all that they’ve done for our country. Toan and some GIGSTERS visit the BAYCAT community as the youth speak up about issues they’d like to address and the changes they’d like to see. Call to action: Inspire to create a GIG Spark. Use your power and multimedia to be the change. Toan sits down to create Thank You cards with founder of InkPaperPlate.com, Sirima Sataman. Call to action: Inspire to DIY - Get crafty and create something hand made and give it to someone: a family member, friend or stranger! Claire Lemmel goes the extra mile to fulfill her mission of making people, including strangers smile. Call to action: Inspire to create a ripple of kindness by spreading smiles and holiday cheer! Smile at a stranger. Psychiatrist Dr. Ron Holt travels around the world to share his inspiring and empowering story to give victims of bullying who contemplated suicide hope and inspire compassion in bullies. Call to action: Inspire to stand up for the truth. If you’re being bullied or have thoughts of suicide, there is hope: TheTrevorProject. Emelinda Narvaez has spent the last 41 years of her life saving the lives of more than 10,000 dogs. Call to action: Inspire to adopt a pet today and give the gift of friendship. With GIG's help, cancer patient, Nico Castro, 6, uses his superhero powers to help his sick friends celebrate Halloween by collecting more than 200 costumes. Call to action: Brighten someone’s spirit this Christmas season by volunteering at your local hospital, writing a letter to a cancer patient, contributing to Make-A-Wish or sharing this story. Jordan Bower walked from Canada to Mexico to create personal connections and inspire people to put down their gadgets and engage in the world around them. Call to action: Inspire to start off the new year by making plans to embark in your personal journey in 2013! Through an aluminum can drive and letter writing campaign, Phoebe Russell, then 5, sparked a movement by inspiring her classmates and her community to raise over $3,000 for the San Francisco Food Bank. She enabled the S.F. 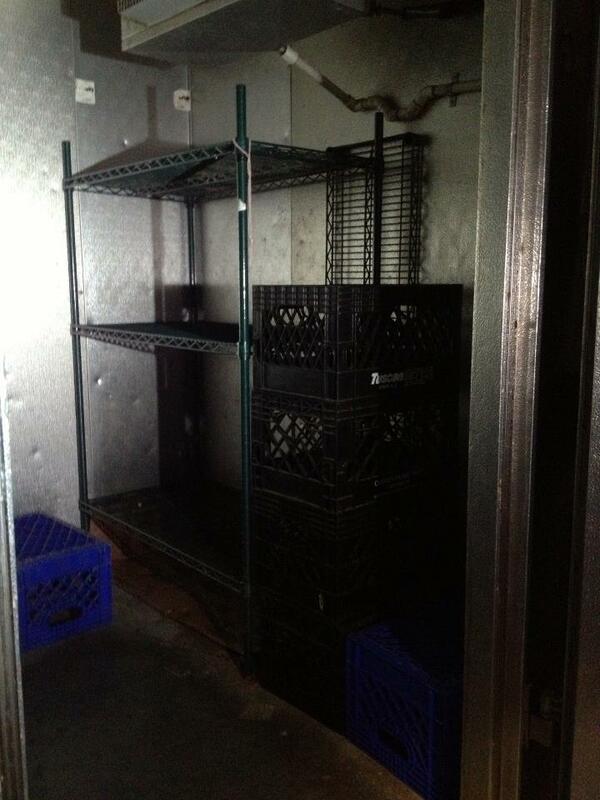 Food Bank to dole out more than 17,800 meals! Our GIG video helped her multiply her message many times over. 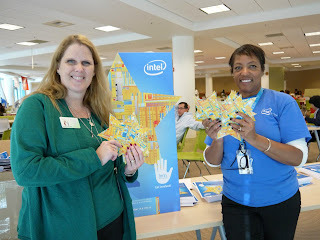 More than 150,000 meals served in her San Francisco community so far! Call to action: Inspire to spread the holiday spirit by donating or volunteering at your local food bank. Julian Cohen, then a high school student in New Jersey, wanted to help Rev. Lemaire Alerte reach his goal of building the first high school in the reverend's hometown of Grande Saline, Haiti. Rev. Alerte was $20,000 short of his $80,000 goal to finish construction. Little did Cohen know, he would start a movement across the nation. 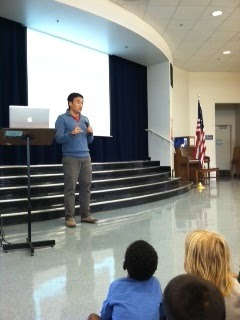 The result: 32 kids would be sent to school in Haiti thanks to his video posted by Go Inspire Go. Watch how high school students in San Jose, Calif., were inspired to orchestrate goodness and be inspired to do a kind thing for a teacher or organization that aims to educate the community. 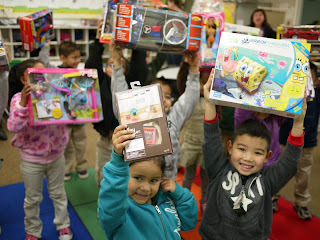 Call to action: Inspire to give what you can to support an educational cause. Money is good, but if you don’t have the funds, give your time and volunteer. Nationally-renowned yoga instructor Kim Shand was born with a birth defect. The prognosis was grim. See how yoga saved her life and how she is giving back. It’ll make you rethink yoga and rethink what’s going on in your life. GIG’s most popular story so far. Meet Jorge Muñoz, school bus driver by day, and Angel in Queens, N.Y., by night. For more than nine years, Jorge has spent half his salary buying groceries and cooking, packaging and delivering home-cooked meals to 150+ people every night. More than 202,800 viewers watched and shared and many used their power to help. You must watch both videos! Call to action: Inspire to lend a helping hand by helping Jorge provide warm meals this Christmas season. Visit www.anangelinqueens.org to see how you can help. *Go Inspire Go is a nonprofit, 501(c)(3), run entirely by Toan Lam and more than 30 volunteers around the world. For more inspiring stories, please check out our YouTube Channel. Here’s just a glimpse of our IMPACT. It’s because of viewers like you and your generous donations that enable us to bring you these original, authentic stories. If you can, please make a donation or if you cannot, there are other ways to help. Share our message and videos. Bless you and our every day street corner-style heroes and organizations -- the true heroes who are helping elevate humanity. Do you ever wonder what happens to your partially used soap bars after leaving your hotel? I've always thought it was such a waste that I only use half the bar or mini-bottle of shampoo, conditioner and body wash. I take them home, then they sit in a zip-lock bag and get old. I always feel guilty for throwing them out. So when I heard about 17-year-old Raghav Rajvanshy's nonprofit organization, Rcoz, I had to share. His mission: to collect and re-purpose partially bars of soap from hotels and send them to underprivileged communities who do not have access to basic hygiene and sanitation. When Raghav was 14-years-old, he traveled to India and stayed at a hotel across from the slums. It didn't make sense that the people living in extreme poverty, didn't have access to basic hygiene and sanitation while many hotel guests were throwing away bottles of partially used soap. His heart sank when he saw the poor people using ash and sand to wash their hands. His research revealed the dirty truth. Thousands of hotels throw away millions of pounds of soap daily. Most of the bottles of partially used soap end up in land fills, further contaminating the ground water. 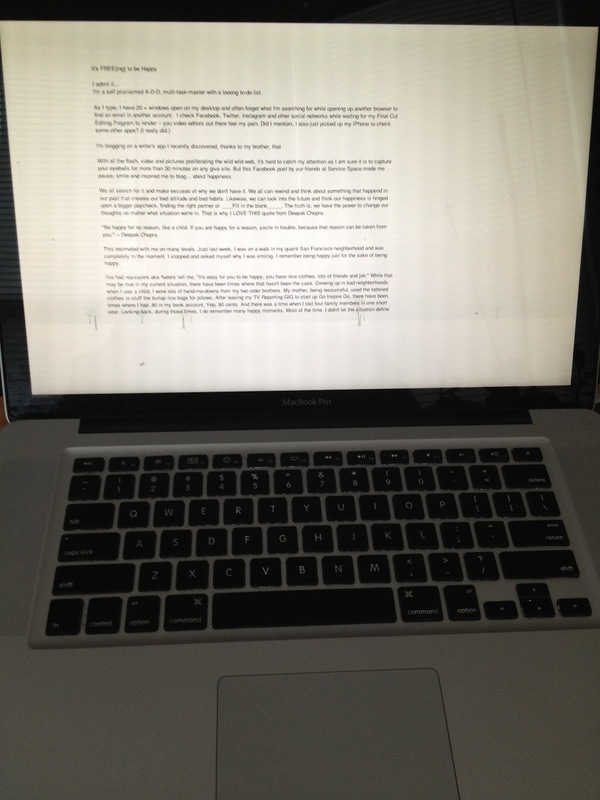 Check out Raghav's GIG Spark (Lesson on Compassion) submission. * Special thanks to GIG Volunteer Akina Chargalauf who was so inspired by Rcoz's mission, she shot and edited this on her iPhone. Spark: Don't be wasteful. Be thoughtful and environmentally aware. Join forces with Rcoz to give the gift of hygiene. His goal is to inspire you to join forces with Rcoz and do a small act -- what you can do -- to help him provide basic hygiene and sanitation to those in need; to promote social and environmentally responsible practices in the hospitality industry while involving youth and community to help him educate people through his educational campaign to prevent the spread of infection and diseases. Action always starts with awareness. Like many of us, Raghav witnessed waste, people in need and during a trip to Yosemite National Park, he realized the nature's natural gifts. It made sense for him to do his part to clean up communities in need and the environment. What can YOU do? It all starts with one small act. Go Raghav Go! "The GIG Spark experience really had a deep impact on me. I wasn't aware that there are so many other people trying and succeeding in making a difference in the world through simple ideas. One of the things about the GIG videos that surprised me is the variety of issues they cover, trying to solve everything from global warming to world hunger. All of these people truly inspire me every day and motivate me to work harder and harder towards my own goal of promoting global hygiene and improving the environment. I see GIG Spark as a great virtual community of youngsters who can learn and take inspiration from each other to help shape the future of our world in a very positive way." 1. 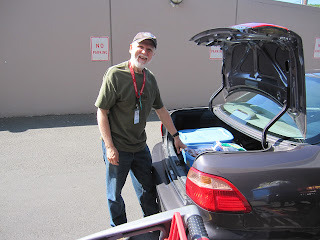 This holiday, Rcoz will collect and distribute care packages to the homeless in San Francisco, San Jose and Berkeley. They're collecting unused travel-sized toiletries, tooth and toothpaste from your dentist. NOTE: Deadline for this holiday distribution is 12/12/12. Other donations are accepted all-year long. 3. Spread the word: Share this video! We hope this video inspires you to be thoughtful this holiday season and use your power to help others. GIG Spark was developed to create compassion through the exercise of brainstorming, problem solving and experiencing the joy of using your power to help others. About Go Inspire Go (GIG): GIG is about inspiring small actions that ripple out to meaningful changes. As we've experienced, the ripples continue to billow out, one story, one person, one act at a time. FEELING INSPIRED? Make your own GIG SPARK and share with us. We may share it with the world. As part of GIG's mission to inspire our viewers to discover their power, we developed GIG Spark: A Lesson on Compassion. The goal is to spark action in everyone that witnesses your good deed. We want you to identify a problem in your community and be the change by capturing your action in a short 1-1:30 minute video. Use your passion and creativity to produce a GIG Spark and inspire viewers with your story! Kim Shand, a nationally-renowned yoga expert, knows that life is not always fair. 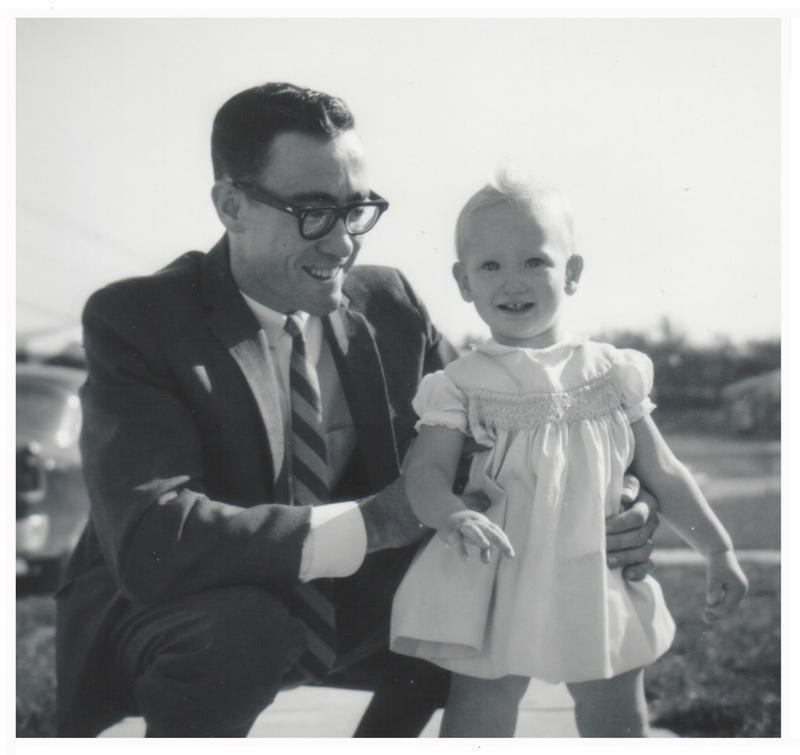 Born with severe scoliosis and vertebrae not fully formed, her prognosis was bleak. Doctors thought she would be paralyzed. She was expected to have stunted growth and a long list of medical complications. They wanted to pump her little body with medicine, screw a metal halo into her skull and brace down her back. At age five, Kim’s parents introduced her to yoga and strength training. Her life changed physically, mentally and spiritually. She says her body self-corrected and miraculously, cartilage grew around her under-formed vertebrae. Then in her early adulthood, Kim life fell off-balance after her father and uncle passed away and after losing her job. You’ll be amazed by how she bounced back and rediscovered yoga and is inspiring tens of thousands of people to take control of their health. It’s hard to believe from these pictures and video that Kim endured such a painful start in life. 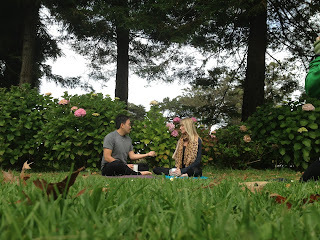 In a special edition of Go Inspire Go’s “Tea with Toan”, we met Kim on the mat in San Francisco’s Golden Gate Park to share Kim’s inspiring and empowering story and life lessons that will inspire you to rethink yoga and rethink your life. Instead of living a life full self-pity, Kim grounded herself on the mat and embraced the challenges – which in turn stretched her possibilities beyond the limits of what seems humanly possible. Kim believes yoga should be accessible to everyone, that’s why she gives away “as many free yoga videos” as possible on her Rethink Yoga website. At Go Inspire Go, we love ripples… many of her students are giving back to her by helping her produce many of the free videos you see on her website. I’ve experienced Yoga with Kim in person and often start my day getting into the rhythm and rhyme of Kim’s yoga videos. Her uniquely calm melodic voice and energy are as soothing as they are strengthening. You can’t meet Kim or experience her yoga videos without feeling recharged, refocused and ready to receive and seize life’s lessons. We’d love to hear your thoughts about how yoga has changed your life in the comments section below. Make it your GIG to Be in. All the Time. When you hear about Nico Castro, a courageous 6-year-old boy from Northern California who, despite his battle with brain cancer, brought Halloween to his friends in the hospital, you can’t help but want to use your power to help this real-life superhero. After Nico was diagnosed with brain cancer last fall, he was worried that he wouldn’t be able to celebrate Halloween, his favorite holiday. Thanks to a break in his treatment, this caped crusader was given the all clear. “He likes being Batman because it covers his bald head. He’s self conscious,” Marlene Castro said, holding back tears. But the news was bittersweet. Nico was sad his friends in the hospital wouldn’t be able to experience Halloween. “What about the other kids?” he asked Raul Castro, his father. “Can we go to Target and get costumes for the kids?” But with the mounting hospital bills, it was impossible for the family to buy costumes and goodie bags for 50 of his friends at Kaiser Permanente Oakland Medical Center. 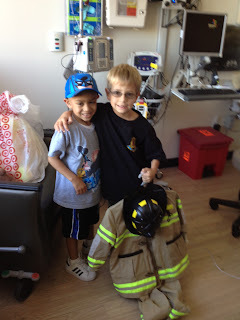 They came up with an idea: start a costume drive to bring Halloween to the hospital. 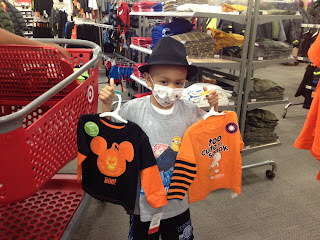 This Halloween hero’s goal was to collect 50 costumes and goodie bags. Since Go Inspire Go (GIG) is about featuring everyday heroes, leveraging social media to build community and spark civic engagement, we had to tell Nico’s story and multiply his good deed. After GIG shared his story, Nico quadrupled his goal and collected more than 200 costumes. Additionally, supporters sent him more than $1,500. Garvin Thomas and his local NBC affiliate Bay Area Proud segment contacted me to feature GIG and Nico’s cause. “I'm so honored to be his mom,” Marlene Castro said. “God really did bless me by making me this little boy's mother. He adds so much love and so much light to our eyes and it's great to see that he's able to touch and impact others lives as well. It's inspiring for all of us." I will always remember the image of Nico walking down the halls of the hospital as he delivered costumes and goodie bags to his sick friends. He put on his sanitary mask – a fire fighter’s costume clenched in one hand, the other clasping his older brother’s hand -- my heart sank. But that feeling didn’t last long. As soon as the parents and children saw Nico, their eyes filled with joy and smiles widened. Their spirits were lifted. Jackie Jumper’s daughter received a witch costume and coloring book from Nico. "It's all very overwhelming for me,” Jumper said. “It's overwhelming to be here with Anne, but it's more overwhelming that a child who is so sick can think of other children at this time and what they need… It's not just a costume or a coloring book. It's about children being happy around these wonderful holidays that they enjoy so much. I remember Halloween growing up and it was one of my favorites. It's just special to these kids… It's very heartwarming and special for him to do that." The kindness continues to ripple outward. Sydney Burnett, a 14-year-old who was given a costume from Nico, couldn’t stop smiling. “It makes me think I don’t have it so bad. He’s worse off than me and he is helping others. It makes me want to do something to help someone else,” Burnett promised. What can YOU do – to give back to someone in need? -Green Apple Books, Sparky’s Balloons, Amanda Rivas and the Rivas Family, DayDreams and Nightmares and Amy Pankratz, founder of Wonder Capes for making superhero capes for Nico and his brother and sister. (1) Contribute to Make-A-Wish: Wish.org. (2) Brighten someone’s spirits. Volunteer at your local hospital or cancer center. (3) Share this story with a child in your life and encourage them to take action. Please take a moment to think about how you can use your power to help those in need. It's the simple, small acts that can be a game-changer when it comes to rebuilding lives. For this Social Good Spotlight, we are featuring local and national nonprofit organizations helping communities devastated by Hurricane Sandy. Read on to learn about what they're doing and how you can pitch in. The Atlantic City Rescue Mission meets a critical need in a five-county area of southern New Jersey by serving all populations of homeless men, women and mothers with children and its mission is to provide emergency shelter services and food in addition to its being a full-service, Christian social service organization. It is currently handling a surge of requests and continues to provide shelter, meals, clothes, food-baskets and referrals for housing assistance. Their sleeping dorms are at capacity and overflowing. Visit www.acrescuemission.org for more information and to make a donation to the Sandy Relief Fund. The Center for Food Action provides emergency food, housing, heating, and utility assistance to low-income people in northern New Jersey. The organization was able to reopen four of its eight sites this past Friday and distribute nearly 60 emergency food packages to hungry families on a first come first serve basis. Two of those sites have electricity and phone services, while the other two are distributing food without power. The situation is critical and food and funds are needed today. 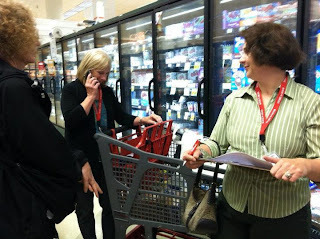 Visit www.cfanj.org to donate money or check out the list of most needed food items. DOROT’s mission is to alleviate social isolation among the elderly and provides services to help them live independently as valued members of the community. DOROT volunteers have helped isolated and homebound seniors in the aftermath of Hurricane Sandy by making telephone reassurance calls, delivering emergency meals and supplies, and assisting with delivering meals to its home–delivered meal program participants. 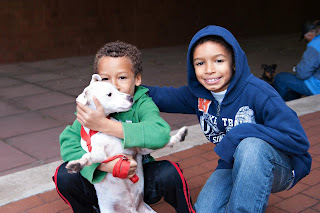 All New York City evacuation centers allow families to bring pets, and the ASPCA has been working closely with them as well as shelters on Long Island to care for more than 400 evacuated pets. Its field team is coordinating animal relief efforts, distributing crates, food, litter and other supplies for thousands of animals throughout the region. The ASPCA works to rescue animals from abuse, pass humane laws and share resources with shelters nationwide. Check out the ASCPA blog to get updates from the ground and visit www.aspca.org to make a donation. 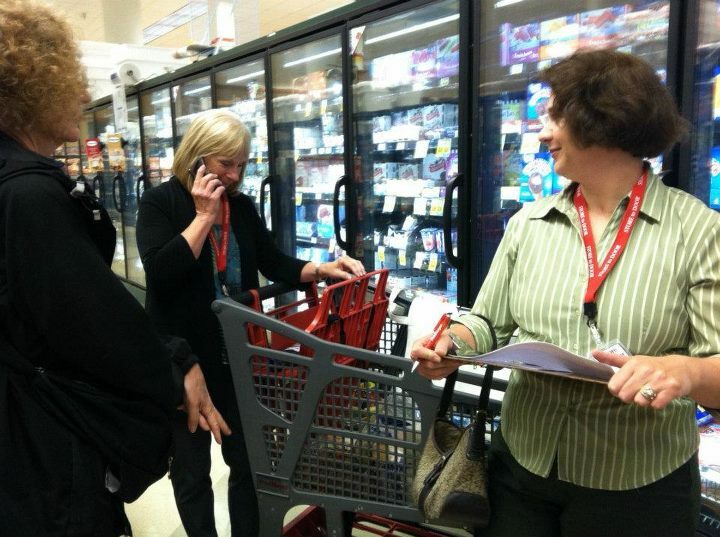 Thousands of Red Cross disaster workers are providing aid and comfort to people affected by Hurricane Sandy. Shelters are open across multiple states and feeding operations are ramping up as communities become accessible. Meals are being provided at shelters and mobile kitchens have been deployed. Trailers full of relief supplies have also been deployed to help people as they begin to clean up their homes. Check out news updates and find out how you can give blood or provide financial support at www.redcross.org. World Vision has distributed relief items – basics like flood clean-up kits, blankets, tarpaulins, hygiene kits, food kits, and other essential items like warm clothes and shoes - through local partners in Queens and the Bronx boroughs of New York City and Yonkers, with more distributions scheduled for the days ahead. World Vision teams are assessing other areas of New York, New Jersey, Maryland, West Virginia, and Kentucky. The organization targets the most impoverished and vulnerable communities in each state and supports local partners - such as churches and community groups - to facilitate clean-up efforts. Visit www.worldvision.org to find out more about its relief efforts and make a donation to its U.S. Disaster Respond Fund. Six-year-old Nico Castro from San Bruno, Calif., isn't letting his battle with brain cancer affect his spirit of giving this Halloween. After his doctor gave him the green light to go trick-or-treating thanks to a break in his chemotherapy, he was jumping for jack-o'-lanterns, what a treat! But here's where it gets tricky. “Even though he's worse off than some of these other kids in the hospital, he's worried about them and oh they can't go trick-or-treating and oh they can't get candy,” said Nico's mother, Marlene Castro, in a proud, but somber voice. This worried little Halloween hero with a big heart asked his parents if they could buy costumes and treats for the kids in the cancer ward. "I was sad they wouldn't have candy," Nico explained. Marlene and her husband Raul Castro were moved by his thoughtfulness, however, it would be impossible to buy costumes and goodies for the more than 50 sick kids in the hospital. The family took a big financial hit after Nico's diagnosis. Nico knows what it feels like to have to sit on the sidelines during the holidays. 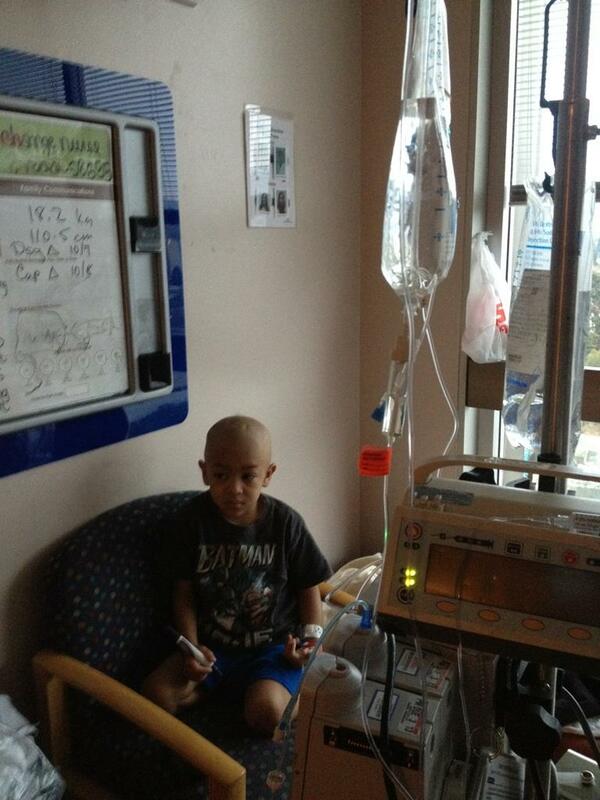 Last November, instead of celebrating, he was in the hospital too ill to take part in the festivities. He was diagnosed with medulloblastoma, cancer of the cerebellum. But during this scary time, all he could think about was if he would be healthy enough to celebrate his favorite holiday -- Halloween. It's amazing to see how the community comes together when they're given a healthy dose of inspiration. After meeting Nico, I quickly realized his superhero power is inspiring people to expand their minds, be more compassionate and to open their hearts. After an initial call with Nico's mother to set up this shoot, I couldn't help but pitch in. I made some calls to local businesses and told them about Nico's story. Sparky's Balloons in San Francisco donated the festive bouquet of balloons and a goodie bag filled with spooky toys and trinkets. My good friend Jessica Chang reached out to Daydreams and Nightmares, a local costume shop in Modesto, Calif., that donated 20 costumes. Green Apple Books in San Francisco donated a $25 gift card after hearing that Nico likes to read. Our Facebook friend, Amanda Rivas from San Jose, Calif., saw our FB shout out, donated 15 costumes and came along to our shoot to surprise Nico. Thanks Rivas family! Since my nonprofit Go Inspire Go brings you stories of everyday heroes, leverages social media to build community and ultimately inspire action, we had a few tricks up our sleeves -- so I reached out to super mom Amy Pankratz, founder of Wonder Capes in Sioux Falls, S.D., and BAM, she quickly crafted a custom Batman cape for Nico and two other capes for his brother, 11, and sister, 8. I told her that Nico likes Batman because the mask covers his bald head. She told me that made her sad, so she made an extra trip to the fabric store and crafted a mask too. The donations and kind acts continue to pour in. My friends asked if we could go to the hospital on Halloween to hand out goodies to the kids. The community has pitch in to offset some of the medical costs. More than $1,200 has trickled in. It is hard to sit back and not take action after meeting this inspiring family who embody the real meaning of family, generosity and being present. "If you would have asked me a year ago that my son would be battling brain cancer and I would be going to the hospital daily, I would have never believed it," Marlene explained. "Ironically, every year we would give donations to St. Jude's Hospital for sick children." It's easy to see where Nico got his kindness, compassion and giving spirit. When you hear of Nico's story, you can't help but reflect on your own life. As a kid, I thought Halloween was about ghosts, goblins, candy and costumes. But as I get older, I realize that at its core, this hallowed holiday is more about giving, not just with candy, but sharing and revering in these little moments with each other. We grew up on welfare, so buying a cheap $5 costume was expensive to us. I have vivid memories of autumn. I can smell the morning dew on the vibrant leaves that crinkled under my little feet -- orange, yellow, brown. My brothers and I were excited for my auntie Hong to get off work and take us costume shopping at the local Thrifty's and Newberry. I remember playing with the flash lights, Halloween Pez dispensers and toys in the store aisles that I would have to put back because we didn't have the money to buy them. Still, we were happy because each of us left with a costume. I never told Auntie Hong how this little gesture and the inexpensive costumes meant the world to us. That's all we cared about. 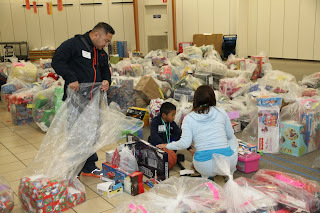 Experiences and connections and simple acts of generosity are what this holiday is truly about. Ironically, Auntie Hong passed away of breast cancer at age 47. I didn't realize it at the time, but Auntie Hong's kind seasonal act had a profound impact on how I see the world today. Her kindness was passed along for many holidays to come. My parents didn't understand or celebrate Halloween or many other holidays, so I made a concerted effort to make holidays a big deal for my younger cousins and now for my nephew and niece. It's inspired me to be kinder to others, give what I can, and to be present and live every day with the attitude of gratitude all year round. It's interesting how the little moments in life come full circle. Now that I have a voice and a platform, I'm using it to multiply the deeds of superheroes like Nico. Nico has undergone extensive surgery to remove his brain tumor, which was about four-and-a-half inches big. Doctors were able to remove most of the tumor from his cerebellum, but couldn't take out the rest of it because it was attached to his brain stem. Meanwhile, doctors believe the prognosis is good, but worry about how the treatment will affect Nico's standard of living in the long run. This one's for you Auntie Hong. Nico, my Halloween hero, thank you for your thoughtfulness and allowing me to say thank you to my Auntie by telling your story! Please don't sit out this holiday. Take action. Update: Nico has collected 85 NEW costumes & 60 USED costumes! 2. Write a letter to a cancer patient to show support. 3. Hug your child or a loved one. Tell them you love them. There is no better way to relax, recharge and reconnect to your spirit than unplugging your gadgets and getting some R&R in nature. From Tweeting to Instagramming, there are so many cool things that are keeping us from connecting the old school way -- especially amongst our youth who grew up with electronics in their phalanges. I love social media, but I try to keep it balanced with exercise and of course going on walks along the water and being enveloped in the trees. It was my personal goal to spend more time with mother nature this year. I always feel these indescribable feelings of stillness and peace afterward. So, naturally, I was delighted to see Rachel Choi's GIG Spark (Lesson on Compassion) submission. Her goal is to inspire people to disconnect from technology and connect with each other (after you read this blog and see this video, of course). Being in nature is like a long meditation and the best part is that it's free. "Something GIG Spark taught me? Don't stop yourself from doing something just because you think it's not going to change anything. Whether what you do is monumental or small, whether it affects a million people or just one person, what's important is that you did something. It's human nature to resist change, but at least you presented a chance to plant a seed of change in someone's mind." We hope this video inspires you to round up some friends and family and enjoy nature. 3. Do what is in your power to help Empowering World Change, a nonprofit that spreads the message of sustainability and empowering kids for global change. GIG is about inspiring small actions that ripple out to meaningful changes. As we've experienced, the ripples continue to billow out, one story, one person, one act at a time. As part of GIG's mission to inspire our viewers to discover their power, we developed GIG Spark: A Lesson on Compassion. The goal is to spark action in everyone that witnesses your good deed. We want you to identify a problem in your community and be the change by capturing your action in a short 1-1:30 minute video. Use your passion and creativity to produce a GIG Spark and inspire viewers with your story! What can YOU do? 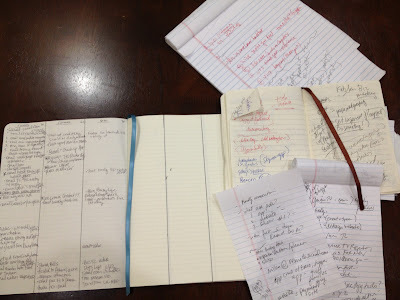 I'm a self proclaimed A-D-D, multi-task-master with looong to-do lists. 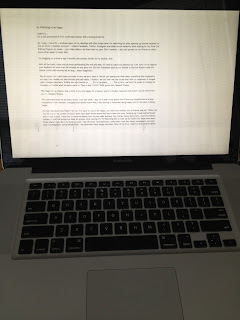 To stay on task, I'm blogging in OmmWriter, a writer's app I recently discovered, that clears your screen and plays zen-like music. With all the flash, video and pictures proliferating the wild wild web, it's hard to catch my attention as I am sure it is to capture your eyeballs for more than 30 minutes on any given site. 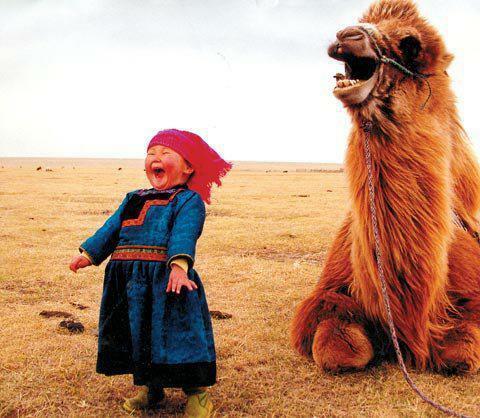 But this Facebook post by our friends at Service Space made me pause, smile and inspired me to blog… about happiness. We all search for it and make excuses of why we don't have it. We all can rewind and think about something that happened in our past that creates our bad attitude and bad habits. Likewise, we can look into the future and think our happiness is hinged upon a bigger paycheck, finding the right partner or _____Fill in the blank_____. The truth is, we have the power to change our thoughts no matter what situation we're in. That is why I LOVE THIS quote by Deepak Chopra. I stumbled upon this sweet message and picture posted by our friends at Karma Tube. This resonated with me on many levels. Just last week, I was on a walk in my quaint San Francisco neighborhood and was completely in the moment. I stopped and asked myself why I was smiling. I remember being happy just for the sake of being happy. I've had naysayers - aka "haters" - tell me, "It's easy for you to be happy, you have nice clothes, lots of friends and a job." While that may be true in my current situation, there have been times where that hasn't been the case. 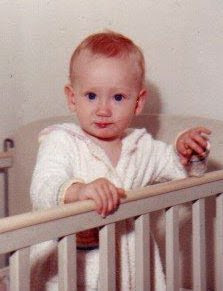 Growing up in bad neighborhoods when I was a child, I wore lots of hand-me-downs from my two older brothers. My mother, being resourceful, used the tattered clothes to stuff the burlap rice bags for pillows. After leaving my TV reporting gig to start up Go Inspire Go, there have been times where I had $0.80 in my bank account. Yep, 80 cents. And there was a time when I lost four family members in one short year. Looking back during those times, I do remember many happy moments. Most of the time, I didn't let the situation define my happiness. As one of my favorite authors, Eckardt Tolle, said, "It is what it is." I've learned to surrender to things that happen around me because I can't worry about what I can't control. That's a good start. Instead, I focus on what I'm grateful for. 1. I'm grateful for the family that I still have in my life. 2. I'm grateful for my volunteers, viewers and everyday heroes we feature on GIG. 3. I'm grateful for my Skype sessions with my niece and nephew. 4. I'm grateful for the crisp autumn air. 5. I'm grateful for my breath. These are just five things I'm grateful for. I made it a habit to log five things I'm grateful for in my gratitude journal before going to bed every night. Oh I have one more to add to the list - I'm grateful for the picture that inspired this blog. As adults, there are so many distractions: social media, climbing the ladder (whatever the ladder may be), material things, living up to the status quo… the list goes on. I guess as the aforementioned picture shows, we have a lot to unlearn as adults and re-learn from children. I know I do. If this makes you happy, please share with someone you love! It’s a special effervescent experience being around kids. You know that warm feeling that makes you smile wider and feel more carefree. Imagine that multiplied 500 times -- that’s what I’m feeling now. 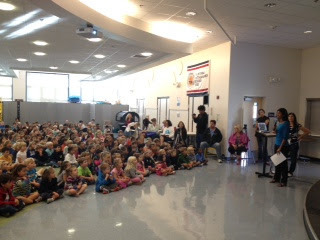 I was recently invited to present Go Inspire Go’s GIG SPARK (Lesson on Compassion) to 500 kids (kindergarten to fifth grade) at Sun Valley Elementary School in San Rafael, Calif. What an honor! The theme: Community Heroes. I’ve been invited to speak in front of prestigious crowds of adults, but never this many children. I’m proficient in public speaking, but worried if the presentation Kala Shah, a mother of a Sun Valley student, and I put together would hold the attention of 500 little people for 30 minutes. Would they pay attention? Would they get our message? Would they take action? I’m impressed with Julie Harris, Sun Valley’s principal, parents like Kala Shah and the faculty and staff at this special school that goes beyond teaching the basics of arithmetic, science, literature, etc. They inspire good citizens with the three Rs: Respect, Responsibility and Ready to Learn. This experience taught me a lot about children. I learned never to underestimate the potential and capacity of a young mind to grasp concepts of compassion and action. I learned that if you have a positive message that inspires goodness, you can captivate the audience of any age. I am honored and amazed that we captured their attention for 30 minutes! I can’t wait to see how this presentation will resonate with them through their GIG SPARKS and actions of compassion that they’re learning through this experience. Many parents tell me they want their child to get civically engaged, but don't know how. Likewise, many of my students tell me they want to do better for their community, but don't know how. Well, GIG SPARK is your answer. Join us in making a video on this LESSON ON COMPASSION. I believe kids are naturally in tune with kindness, giving and service. Wouldn’t it be great if we adults paused right this minute and channel our inner child and do one kind thing for another person? As Maya Angelou said, "If you know better, you do better." Now you know, please help our youth do better. 2. 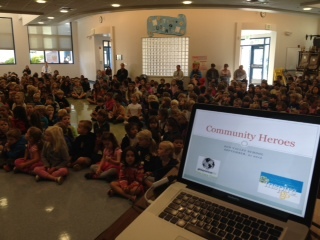 This presentation inspired Kala Shah to create a new “Community Heroes Club” to brainstorm service projects. She will share the GIG SPARKS that are ignited from the club via GIG. Make it your gig to start a Community Heroes club and let us know about it. Warning: this will make you smile! Thank you to 14-year-old Mini Rasekhy from Singapore for sending us this GIG Spark when she was in San Francisco this summer. "Making my GIG Spark video helped me realize that there are always people who aren't having the best days, and just a nice little gesture can turn their day around and lift their mood. Of course going out to film was a bit awkward at first because I was singing to people I didn't even know, but I kept in mind that what I was doing for them was a good thing. Everyone's positive reactions gave me the courage to go out and sing more! As I said in my video, I think singing to someone can make their day. I know for a fact that it's made my life amazing." In true GIG spirit, Mini is using her power to make someone else's life better. Way to go Mini! I was honored and excited to inspire these children to "discover their power and use it to help others" as a part of a "Community Heroes" assembly. How cool is that?! They were captivated for the whole 30 minutes. I wonder what impact and ripples this presentation will make on these kids -- and likewise how the ripples, like Mini will be changed by her GIG Spark. I showed this video as an example of how easy it is to use your natural abilities to give back. The kids laughed and smiled when the man started to sing back to Mini. Talk about paying it forward and rippling out her original intention to use her voice to make someone's day brighter. Don't have the gift of song? Not to fret. Think about what you're naturally good at and what you enjoy doing -- and think about how to use it to be of service to others. And pull out your video camera or cell phone to capture a GIG Spark for the world to see. We hope this video inspires you to use your voice to help others in the next 24 hours. 1. Think about how you can use your voice for good. You don't literally have to sing to each other; you can use your voice and platform to rally for something you believe in. 2. Music education is important, but music is being cut out of programs across the US. VH1 Save the Music is just one program that "helps develop long-term, sustainable instrumental music programs that provide children with equal access to music education regardless of their financial situation." Contact this foundation to see how you can help. 3. After watching a GIG video about Rev. Lemaire Alerte, who wanted to build a high school in Grande Saline, Haiti, band students at Willow Glen banded together and orchestrated a winter benefit concert to send kids to his school. My students activated their storytelling, shooting and editing skills to create this PSA. This ultimately sent 32 kids to school in Haiti. Again, you don't have to sing or if you're musically off-key (like me), think about how you can use your voice for good. And take action! What is Store to Door? Store to Door is a nonprofit organization that provides personalized, low-cost grocery shopping and delivery services to seniors and people with disabilities. Established in 1989, over 200 volunteers fill and deliver more than 7,000 orders annually in the Portland and Beaverton communities in Oregon. 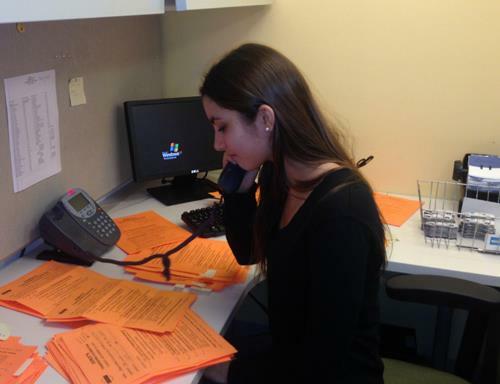 Besides providing a reliable and inexpensive service, Store to Door’s volunteers and staff reduce clients’ isolation by building relationships through weekly phone calls and visits. 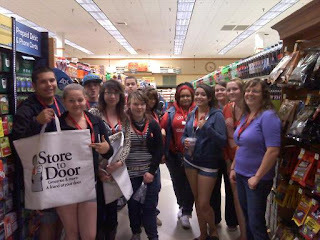 Store to Door was honored by Portland Monthly Magazine and the Oregon Community Foundation as a nonprofit organization “whose extraordinary acts of service have raised the quality of lives in Portland” and received the Volunteer Innovation Award from Hands On Greater Portland and the Portland Trail Blazers. What inspires Store to Door to do this work? Store to Door was modeled on a similar program in Minnesota. In the early 1980s, Dr. David Berger formed a nonprofit corporation that conducted research on community and social welfare issues and found that there was a group of elderly persons who could live independently but could not do their own grocery shopping because of various health and mobility issues. Unable to get other agencies to start a reasonably priced grocery delivery service for this group of people, Dr. Berger, along with colleague Judy Madaj, decided to do it themselves. In 1984 in south Minneapolis, Store to Door was born, and its work inspired the creation of the Portland organization five years later. Store to Door is more than a grocery delivery service; it is a “friend at the door” that aims to make life easier for its clients and their families. As the elderly continue to be the fastest growing segment of our population, family members often feel stressed about prioritizing an aging parent, their work, their children, and their own needs. Store to Door is able to relieve these caregivers of at least one time-consuming task, as well as provide assurance that their loved ones are being contacted and visited regularly. How can GIGSTERS get involved and help Store to Door? - Volunteer - Volunteers are the backbone of Store to Door’s service. Ranging from teens to people in their 90s, they all have a desire to assist neighbors who need a little extra help. All it takes is a couple of hours a week to either take orders, shop or deliver. - Donate – Your donation will help make Store to Door accessible to everyone who needs its services. - Like Store to Door’s page on Facebook - Keep in touch and get the latest news from Store to Door. There’s a sweet twist to this lemonade stand story that will quench your thirst to take a stand to help elevate your community and humanity. Take a sip and read on…. Sometimes the best life lessons can be learned from kids. Kids like Miss Vivienne Harr of Fairfax, Calif. Vivie, as she likes to be called, is a personality-full-cup-runneth-over, 8-year-old philanthropy phenom who set up a lemonade stand – or what I like to call Lemonade Stand 2.0. Vivie was inspired to take a stand against slavery after seeing an installation on slavery by Lisa Kristine, a photographer who captured these authentic, haunting, gut-wrenching snapshots of modern-day slaves around the world. 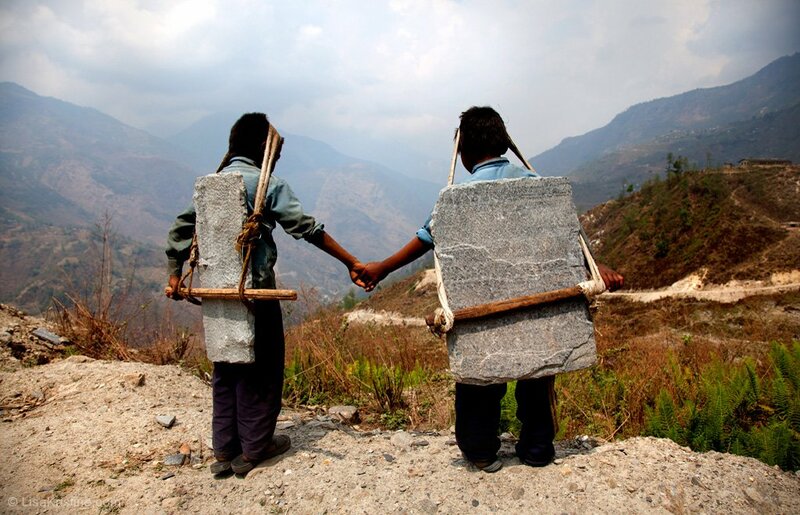 Vivie was particularly moved by this picture of two Nepalese children carrying huge rocks on their backs. The family cried in disbelief. They went home and researched slavery and human trafficking. Vivie was inspired to take action. Watch how she quickly garnered tens of thousands of supporters from the local and worldwide community and raised more than $50,000 dollars in just under two months. Vivie's project went viral after Nicholas Kristof, a New York Times op-ed columnist, tweeted about @vivienneharr and #MAKEASTAND LEMONADE. She's also been featured on many media outlets including the BBC, Yahoo and is slated to appear on Jeff Probst's talk show, which debuts on Sept. 10. All the business acumen that Vivie had was selling lemonade. She took a stand and did something – selling lemonade was in her power to be a voice for the voiceless. Rain or shine, Vivie plans to set up shop and sell her organic, free trade, made-with-love lemonade every day until they raise $150,000 to free 500 slaves. All of the proceeds will go to NOT FOR SALE, a nonprofit organization that re-abolishes slavery around the world. Won’t you join her and make a stand? L to R: Toan Lam, Alexandra "Mom" Harr, Vivienne Harr, Jen Schumacher. Vivie isn't stopping at her $150,000 goal. She's working with investors to bottle her #MAKEASTAND LEMONADE ... stay tuned! Meanwhile, I’m going to focus on seeing things through a child’s lens more often. Sweet. Cheers! 1. Make A Stand: Contribute to her campaign on Fundly! 3. Make A Stand: Use YOUR Power to Stand for What YOU Believe In!